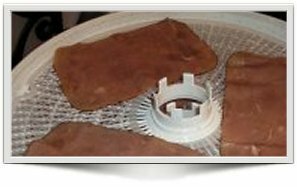 When dehydrating chicken, it's much simpler to use pre-cooked, pre-sliced chicken breast, either sliced fresh at the Deli counter, or from meats sold in tubs! 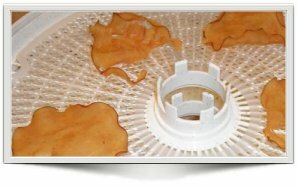 Dehydrating Chicken is Very Easy to do! 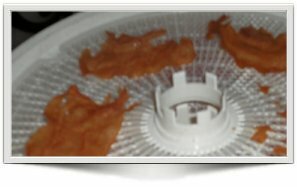 Here are some photos of the sliced chicken on the dehydrator 'before' and 'after' dehydrating. I decided to use my favorite sandwich meat in a tub: yeah, I sometimes don't have time to stand in line at the deli! Shown on the dehydrator trays (coming up, below) are slices of pre-cooked sliced Chicken Breast by Hillshire Farms. The package filled four of my Nesco Dehydrator trays (see below), with five slices on each tray, and it only took TWO hours to become fully dehydrated! When dehydrating chicken, don't forget to use cooked meats left over from your Sunday Roast Chicken dinner. Make sure you evenly slice the pieces and make them of a uniform size; that way they will dehydrate uniformly – i.e. at the same rate of time. Pre-cooked chicken is best dehydrated at 160°F as mentioned above - but please consult your food dehydrator's owners manual for their specific instructions. Re-hydrate in Chicken Stock for Added Tastiness! As you can see in the photo above, just look how crispy the chicken was after dehydrating! I then purposely draped a slice of the re-hydrated chicken around my finger so you could see that it was indeed moist again. IMPORTANT: Re-hydrate in the refrigerator in CLEAN water or the stock. Don't leave it out on the counter top! Don't let the chicken go 'off'!